My goodness we are already into day 4 of the New Year and I can't say I have accomplished little of anything. I need to put my Christmas decorations back in their boxes and bins and get this home back to normal along with life in general. Holidays are wonderful (altho mine not so much this year) but aren't you ready to get some normalcy back? Put away all those lovely gold ornaments and buy some spring tulips at Trader Joe's, that's what I need. 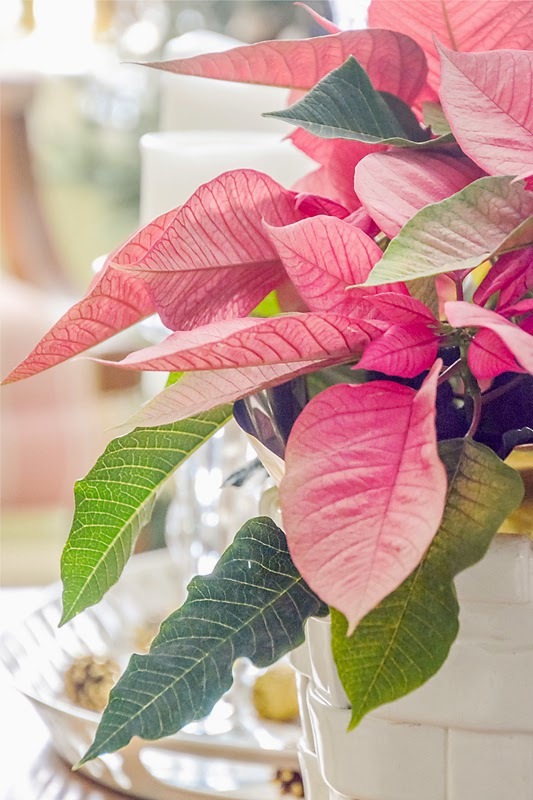 Altho I will hang on to this pretty pink poinsettia for as long as I can. And no, I am not one to try and keep them alive until next year, putting them in darkness for so many hours in the day, and all that other stuff that goes with trying to hang on to something that only cost me $4.99 at Loews. I have bigger challenges to conquer. We had our first significant snow-fall today which reminded me of a line from a book I am currently reading. The book is "Tell the Wolves I'm Home" and in chapter seven June (the main character) who loves to walk in the woods behind her school says this, "after a snowstorm is one of the best times to be in the woods, because all the empty beer and soda cans and candy wrappers disappear. Plus there is just something beautiful about walking on snow that nobody else has walked on." I can identify with that beauty. I have to agree that untouched snow that covers up all the dead grass and leaves and dog poop (sorry) is really magical. But with my 2 kids, that magic disappears in a flash. Which brings me to another something that I love...a hot cup of coffee on these wintry afternoons. I have a little personal Kuerig and I stock up on de-caf coffee so I can enjoy that one cup as the sun drops quickly toward sunset. But hallelujah, we are gaining light with each passing day, minute by minute. By the way today is National Trivia Day and to add to your trivia knowledge during the month of January we will gain 49 minutes of daylight with 33 minutes added at sunset and 16 minutes at sunrise. Funny, somehow I thought it would be evenly distributed between sunrise and sunset. Just add that to your wealth of trivia knowledge. And is anybody excited about the return of "Downton Abbey"? My gosh this TV winter break just about drove me crazy. I did watch a couple of limited TV shows....remember when they used to call these mini-series? "Mozart in the Jungle" on Amazon Prime was quite delightful about an eccentric NY Symphony orchestra director and the "behind the scenes" life of its members. And I also watched "Missing" on Starz, quite disturbing about a child kidnapping. The acting was outstanding and the eventuality and changes in the lives of those effected (or is it affected?) was staggering. Tonight many of my favorites are returning with a couple of new ones to be added to my list. During these cold winter months I have a habit of going to bed early and watching TV in bed. I am going to blame it on my "kids". They can't wait to crawl in bed to fall asleep all comfy and cozy. The only time they perk up is if I happen to go down to the kitchen to grab a little snack for myself. But when they realize it is not for them, back to sleep they go. And honestly it is so much warmer snuggled in bed than it is sitting downstairs. Remember how I mentioned there are some advantages to living alone...this would be one of them. So stay warm, stay healthy and be content.....!!! like your little european robin cup. so sweet. That is a wonderful little cup! Happy winter. It was -28 F here this morning. So excited for Downton!! I watched all of the last season yesterday in preparation! I have to agree about the snow - it's quite magical - I truly love it (which is a good thing considering where I live.) I still don't watch much tv but will be tuning in to Downton for sure. Enjoyed your post as usual. DA is going to be the next thing I binge watch. I lay in bed watching whatever episode just happens to be on. I really enjoy period pieces anyway...and especially anything European! Can I just tell you how much I ADORE that bird on your cup? Thank heavens for the light creeping in this month!! Hope 2015 is a good one for you Deanna. Can't wait to see DA tonight. Like you, we've found some interesting shows on Amazon or Netflix - next to nothing on network TV. Bummed today though, by the Bengals' loss. Not a real fan - only a fair-weather fan, so I'm done this year. Lovely photos, especially that little Robin cup. Yes thankfully the rush of the holidays is over... I am turning a corner.. Taking a blogging break and have permanently deleted my Facebook page are helping me to reprioritize my daily thoughts and activities... My forced retirement with a permanent partial disability has changed my life and what I thought it would be. Looking forward to more quiet time with the Lord and seeking His perspective. I agree, the snow covers all "the stuff" making everything white, peaceful and pristine . . .
Love your little coffee cup! I may have to think about a personal Keurig . . . nice treat for me! Off I go to curl up under the comforter . . . great idea . . . thank you! I've been slow going on putting decorations away, but my poinsettia definitely needs to go. Tomorrow! I need to get things neatened up and get back to the gym. Did see two movies this weekend and watched "Downton" tonight, but order out of chaos is next on the list here. I do love that robin decorated mug and your beautiful pink poinsettia. I'm loathe to take down my Christmas tree - it's such a cheerful presence in my little home still! Happy New Year! Aww hi there Deanna, love the veins in the Poinsettia, such a wonderful color. Happy New Year to you, sorry to hear you have been sick. The stuff hasn't hit our state yet but I am sure it will, I sure hope I can pass the flu by but as we know it usually comes to older people. Maybe I need to just stay inside and not go out. :) Looking forward to getting together with you when you come, and catching up on what you have been up to. Stay warm this week and yes extremely happy for Downton to return. Love that little mug, Deanna! Hi Deanna ... get ready for another snowfall tonight! and the temp drop ... guess winter is here to stay! snuggle up with your two "kids" and a good book this week!! I hate to see Christmas go but once it is boxed and bagged, I feel liberated (sore, but liberated). 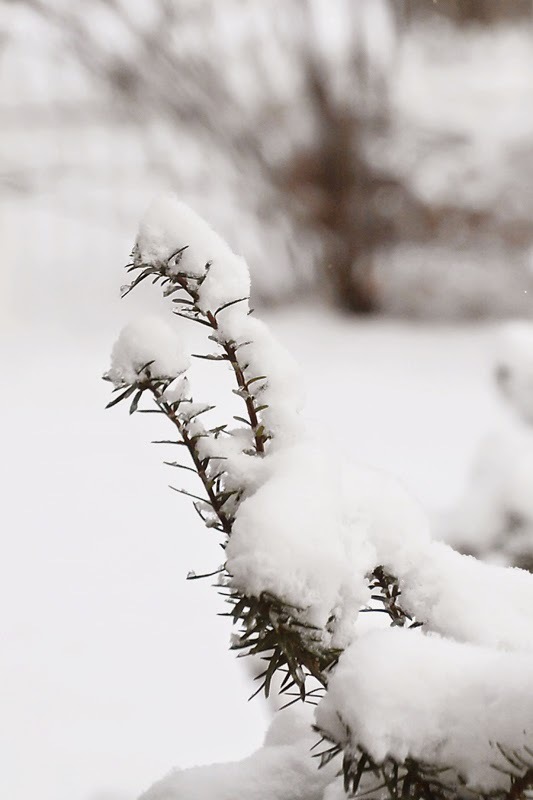 Your snow is pretty and after last year's winter, you may keep it. I know, too generous of me , but I'm like that. Really must agree about how beautiful, fresh, and silent everything is immediately after a snow - and then it goes brown (or yellow .... ahem!). So excited Downton Abbey has restarted - now if only some of the others that went on leave would come back I could settle into a long winters slumber in front of the TV. Hi Deanna and Happy New Year. We finally got our Christmas decor all put away this past weekend. It seems bare both inside and outside with the pretty lights all put away for another year. Still it's nice to settle back into a normal routine. - We've had very little snow here this winter which is fine by me. Of course the grass is a bit soggy from all the rain but I don't mind too much. - I've never watech Downtown Abbey. I'm into silly trivial stuff like (The Bachelor) which just started last night. I enjoy a nice Wine Cooler on Monday nights and watching crazy women compete for one guy. I know, call me crazy but it's fun. Looking forward to seeing you posting here again this year. 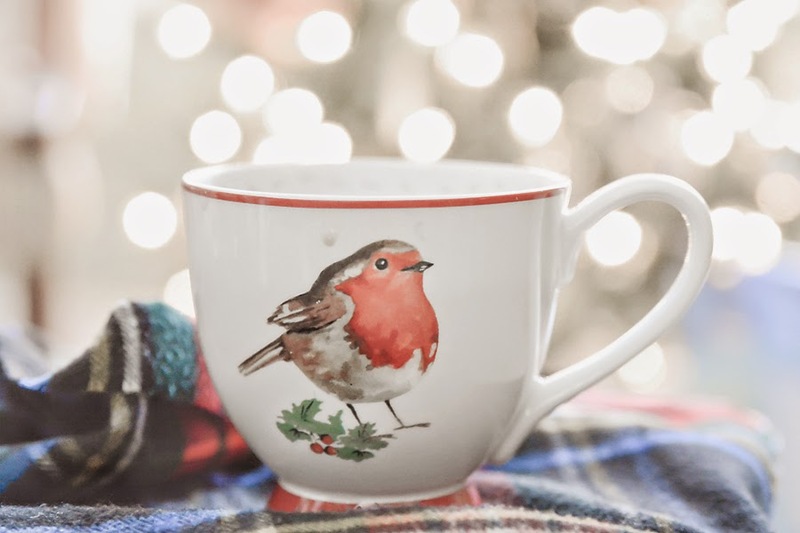 Love the bird on your cup and the poinsettia is still so pretty. I haven't taken my Christmas trees down yet. I so enjoy the lights and everything looks so bland after the Christmas decor is put away. But, I guess I'll start on that task tomorrow. Unless a good book calls to me first! lol! Hope you have a good week and stay warm! I too love that the snow covers up the dreary ground, but my little dog suffers too. Wishing you God's blessings of peace and comfort in the year to come! Happy New Year Deanna! Enjoy Downton and stay warm! Fresh fallen snow is one of my favorite things - as long as I don't have to go out and shovel it. But a nice cup of coffee (in your very pretty cup), a good, book, and snow falling sounds like heaven to me! Have a wonderful weekend! Hope that all is going well, and the new year is giving you a fresh start. You have to have the most amazing cup collection of anyone that I know!